The cargo pod Leonardo, a multi-purpose logistics module for the International Space Station, is attached to the Earth-facing berth of the outpost's Harmony node on April 8, 2010 after being moved from shuttle Discovery's payload bay during the STS-131 mission. Full Story. This story was updated at 8:44 a.m. ET. HOUSTON ? Astronauts moved a cargo module thesize of a mini bus the short distance from space shuttle Discovery?spayload bay to the International Space Station?s (ISS) Harmony node Thursdaymorning, setting the stage for a carefully choreographed ballet to begintransferring tons of supplies and equipment to and from and the orbitinglaboratory. The space station special delivery wasperformed by STS-131 mission specialists Stephanie Wilson and Naoko Yamazaki,Japan?s second female astronaut, who as the shuttle crew?s loadmaster -- orcargo chief -- will oversee the nearly 120 hours of transfer work. That work is spread across the next nine daysto move new science equipment, fresh supplies and spare parts from the cargopod to the space station, and then fill it again with brokenequipment, trash and other gear for their return to Earth. 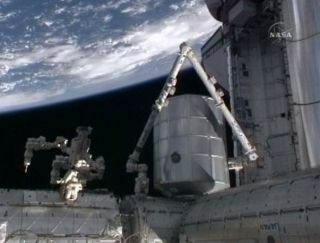 Using the station?s Canadian robotic arm,Wilson and Yamazaki maneuvered the Italian-built module, named ?Leonardo,? toits berthing port on the nadir, or Earth-facing, side of Harmony and latched itinto place at 12:24 a.m. EDT (0424 GMT) on Thursday as the shuttle and stationwere traveling 220 miles above the South Pacific ocean, north of New Zealand. "Glad to have an MPLM aboard, let transfer begin!" radioed Wilson, after being congratulated by mission control for a job well done. Discovery mission specialist Clayton Anderson, himself a former station resident, and station flight engineer Soichi Noguchi representing Japan worked through the procedures for several hours to enter Leonardo but ran into a brief snag opening its hatch. After waiting a few minutes for the pressure to equalize between the station's and the module's atmospheres, the astronauts were able to open Leonardo at 7:58 a.m. EDT (1158 GMT). "Good news, we got the hatch open," radioed Anderson. The Leonardo moduleis about 21 feet (6.4 meters) long and 15 feet (4.5 meters) wide, and weighed about 27,274 pounds (12,371kg) -- 17,000 pounds (7,711 kg) of which were spare parts and equipment for thestation's crew -- when it was packed for Discovery's13-day mission. The shuttle docked at the station early Wednesday. Some of the bigticket items for the station inside the moving van-like module are severalracks of new science experiments, each of them the size of a double-widerefrigerator. The module also contains a new astronaut bedroom for the station,which will eventually be converted into the equivalent of space shower for crewhygiene. Leonardo alsodelivers a novel device designed to create water for the station's crew using waste hydrogen andcarbon dioxide gases. The process creates methane as well, which will be ventedoverboard, NASA engineers have said. This is NASA's lastround trip flight for Leonardo as a multi-purpose logistics module, or MPLM.When it next flies to the space station later this year, it will be attachedpermanently to serve as a walk-in closet and storage facility for the outpost?screw. With the cargo modulenow attached to the ISS, Discovery?s payload bay is left empty less a hugespare ammonia coolant tank to be installed on the station's exterior during themission's three planned spacewalks. The first spacewalk is slated to begin onFriday. Before Leonardo couldbe moved into place, engineers on Earth needed to first clear the heat shieldon Discovery?s starboard, or right, wing from needing further precautionarydamage inspections because once installed, it would have been difficult tomaneuver the shuttle?s robotic arm to where it could gather the data needed. A main antenna failure on Discovery forced the shuttle crewto wait until arriving at the station to beam the preliminary data collected onTuesday to Earth. Mission managers willcontinue to sift through the data to determine if Discovery's heat shield hassuffered any damage severe enough to warrant extra inspections or repairs. Sofar, NASA has found no cause for concern with the shuttle's heat shield. The inspections are astandard part of every NASA shuttle mission since the tragic loss of shuttleColumbia and seven astronauts in 2003. Heat shield damage caused by debrisduring liftoff caused the disaster, so NASA has developed inspection and repairtechniques to keep close watch on shuttle health. The current shuttlemission is one of NASA's four final shuttle missions before the agency retiresits orbiter fleet in the fall. Space station flightdirector Ed Van Cise said that high data traffic on the space station's owncommunications network slowed the transfer of Discovery's heat shieldinspection data to Earth. "As we're allused to at home, sometimes some networks are slower than others," Van Cisesaid.